There were approximately 25,000 Chileans exiles in Sweden in the years after the military coup of Augusto Pinochet of 1973. In the spring of 1977, Gösta Ohlsson, a member of the leadership of the Social Democratic Party (Partistyrelsen) and the official in charge of the Latin-American desk (or international relations) contacted Mario Espinoza (nom de guerre “Juancho”) – at that time a member of the Central Committee of the Movement of the Revolutionary Left (MIR), and in charge both of the MIR-Exterior Office in Sweden, and the “Junta de Coordinación Revolucionaria – JCR” [The Revolutionary Coordinating Junta, composed of the Chilean Revolutionary Left Movement (MIR), the Argentine People’s Revolutionary Army (ERP), the Uruguayan Tupamaros, and the Bolivian National Liberation Army (ELN)]. The MIR-Exterior was the international bureau of the MIR, Movement of the Revolutionary Left, operating abroad to support activities of the anti-Pinochet Resistance led by MIR in Chile. During that time the military governments of Argentina, Brazil, Chile and Uruguay, had formed an operative terrorist alliance called the “Operación Condor” (Operation Condor, aimed a) To liquidate oppositional figures in exile – several bloody executions took place in different countries – and b) To counter arrest Resistance activities of the “Junta de Coordinación Revolucionaria” of South America’s Southern Cone, formed mainly by, MIR-Chile, ERP-Argentina, ELN-Bolivia, and the Tupamaros of Uruguay). Being the presence of MIR in Scandinavia the main among these organizations, MIR instituted in Sweden a counter-intelligence unit to fight Operación Condor activities in Scandinavia. I was designated to lead the unit. 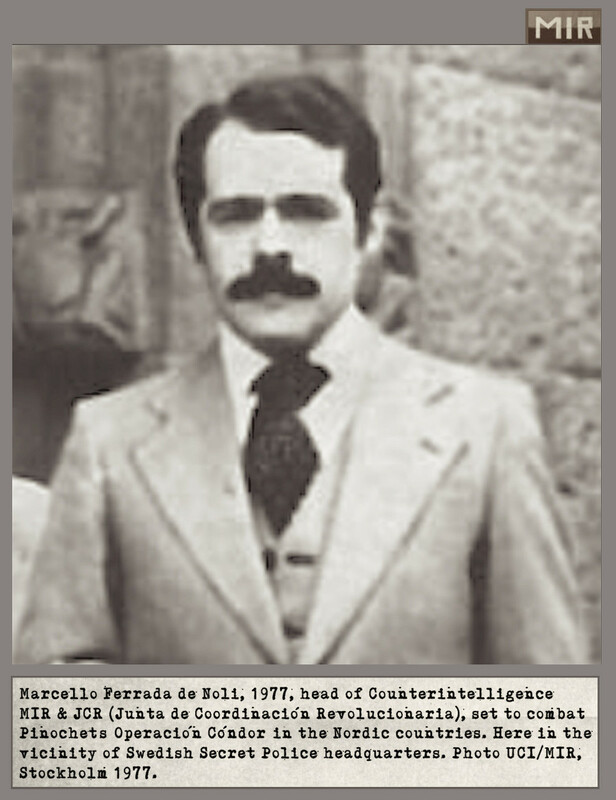 Mario Espinoza agreed with the proposal, and said, “The people working with it should get in contact with Ferrada-Noli who is in charge of our counter-intelligence unit”. 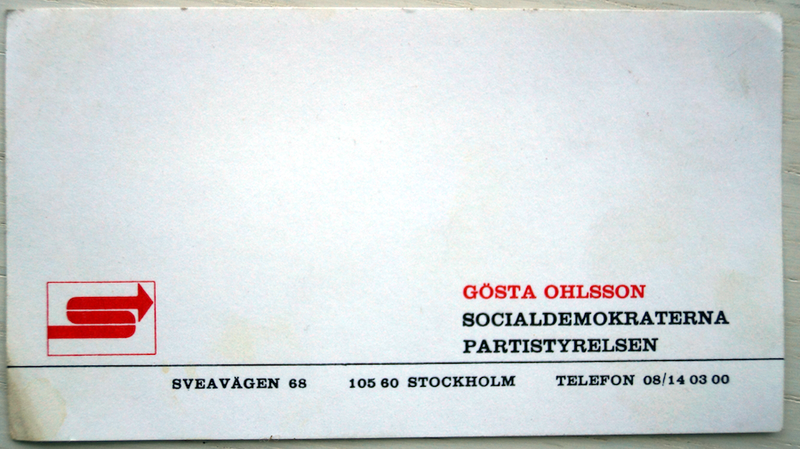 The same afternoon I received a call by an officer from the Swedish Security Police (the meeting with the social democrats at Sveavägen 68 was held 11.00 AM). At the end of the meeting Mr Ohlsson handed over to me his visit-card and told I was welcome to contact him on the progress made (I never did, as the contacts went on with the SÄPO and the activities were undercover). We wondered how it was that social democrats knew about our monitoring of the Junta agents and presumably operatives of Operation Condor. After all we worked with tight clandestine routines, encrypted communications, etc. ; all members of my unit – and we were only few – were former combatants with long experience in undercover work and also survivors of Pinochet harsh prisoners camps (Quiriquina Island, Chacabuco, and Concepción). It was no task for “civilian” social democrats – or for that part not a possibility for any civil organization – that with normal means they would be able to get insight about our operations. The most credible, we reasoned from the beginning, is that the information was passed to the social democrats after a professional surveillance – technically superior – done by the Swedish Security Police. But again, how come it was the Social Democratic central bureau that contacted us? Why the high-ranking party official at 68 Sveavägen st. said explicitly “Our contacts in the Swedish Security Police informed . . .” ? Further, the Social Democratic Party it was not at that time in charge of the Government, it was not an “official” party – why they would enjoy official contacts with an official institution such as the National Security Police? Some answers became clearer while doing the talks on behalf of my unit at the Security Police headquarters at the Kungsholmen compound. It is not that solely judging after the contact-episode above I would be in position to prove that some kind of communication pipes between the Security Police and the Social Democratic Party did exist systematically. Yet, my strong impression was – after the conferences and several walks I had together with the gentlemanly senior official of the Security Police in the nearby park – that this was the case. That they did cooperate. [in the picture at right, the author standing outside the Court & Police building in Kungsholmen, Stockholm, 1977. Zoomed photo taken by one member of the UCI (our operative unit) and film developed in our artesian lab]. The contacts lasted for about two months, until the situation was declared under control. Operación Condor in Scandinavia was namely neutralized and no political exile figure was killed in spite of the over 30,000 exiles from the corresponding Operation Condor countries living there at the time. However several assassinations occurred elsewhere. During these activities I met several Swedish Security Police officers – outstanding professionals – including two senior-ranking officers. Incidentally one senior officer presented me fortuitously to Prime Minister Thorbjörn Fälldin, while he was at the Security Police headquarters using a “sport facility” located in the building – I omit saying where. I will not give here more details, or names, etc.